All my boots are flat, I need more with heels! These look crazy tall, but with the platform the heel feels like 3.5 inches - not exactly a negligible amount, but not as intense as they look. Buy these William Rast boots at Nordstrom for $399. 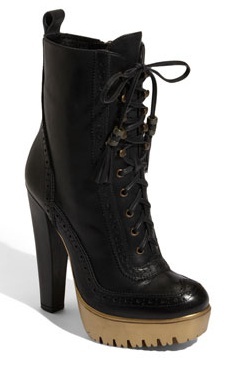 I ADORE rugged boots and these have a metallic gold lug heel! drool!!! !